Dueling Petitions From Scientists To Congress On Subject Of “Climate Change” – How Can People Be So Stupid? If it were not costing us billions of dollars per year, today, and probably going to cost us trillions of (wasted) dollars in the future, the whole climate change subject would be amusing. On the one hand, you have the UN’s IPCC publishing alarmist documents based on flawed computer models that are championed by the likes of Al Gore that say that civilization will cease to exist as we know it if we don’t spend trillions of dollars to reduce our levels of CO2 emissions. On the other hand, you have a huge group of scientists who realize that the whole thing is nothing more than a scheme by the globalists to transfer wealth from the wealthy nations (primarily the United States and Western Europe) to the poor, developing nations. The problem for the alarmists is that as time goes on, their arguments become increasingly hollow and even get disproved. The only two things that both sides can agree on is that climate does, indeed, change, and that atmospheric CO2 is increasing due to mankind’s burning of fossil fuels. But, the evidence that the climate is going to heat to such a degree that it will cause untold misery, death, and destruction due to that increase in CO2 is becoming more doubtful by the day. It looks to me like the global fever just broke! And, of course, there was no corresponding dive in CO2 levels, as you can clearly see in the “World Climate Widget” in the sidebar of this web page. Interestingly, people like Joe Bastardi, of Accuweather, and many others, have been predicting this huge drop in temperature because we were coming out of an El Nino period and going into a La Nina. Many experts firmly believe that it is forces other than CO2 that are the primary drivers of global temperature. Things like El Ninos, La Ninas, solar activity (or lack thereof), cosmic rays (or lack thereof), decadal and multi-decadal ocean temperature cycles, volcanic activity (or lack thereof), and other forces. If nothing else, the above graph clearly shows the effect of El Nino and La Nina. The biggest problem with the alarmists’ argument is that it is based on flawed computer models; not on actual observations. Their data is cooked and manipulated to give the answers that they want, as shown here, here, here, and here. When you hold their models up to actual observations, they often fall apart. (At which time the alarmists blame the observations, and state that they must be wrong!) Furthermore, with a clearly unscientific attitude, the global warmingistas have done their very best to obfuscate or even loose the data and prevent people not in their fraternity to actually view and analyze the data. Here is the open letter that was sent to the Congress of the United States by the global warmingistas. After it, I publish the open letter from an even larger group of scientists that states that “the science is not settled”, and that there is no solid evidence that climate change is being driven by man-made CO2. As you begin your deliberations in the new 112th Congress, we urge you to take a fresh look at climate change. Climate change is not just an environmental threat but, as we describe below, also poses challenges to the U.S. economy, national security and public health. Some view climate change as a futuristic abstraction. Others are unsure about the science, or uncertain about the policy responses. We want to assure you that the science is strong and that there is nothing abstract about the risks facing our Nation. Our coastal areas are now facing increasing dangers from rising sea levels and storm surges; the southwest and southeast are increasingly vulnerable to drought; other regions will need to prepare for massive flooding from the extreme storms of the sort being experienced with increasing frequency. These and other consequences of climate change all require that we plan and prepare. Our military recognizes that the consequences of climate change have direct security implications for the country that will only become more acute with time, and it has begun the sort of planning required across the board. As with the fiscal deficit, the changing climate is the kind of daunting problem that we, as a nation, would like to wish away. However, as with our growing debt, the longer we wait to address climate change, the worse it gets. Heat-trapping carbon dioxide is building up in the atmosphere because burning coal, oil, and natural gas produces far more carbon dioxide than is absorbed by oceans and forests. No scientist disagrees with that. Our carbon debt increases each year, just as our national debt increases each year that spending exceeds revenue. And our carbon debt is even longer-lasting; carbon dioxide molecules can last hundreds of years in the atmosphere. It is not our role as scientists to determine how to deal with problems like climate change. That is a policy matter and rightly must be left to our elected leaders in discussion with all Americans. But, as scientists, we have an obligation to evaluate, report, and explain the science behind climate change. The debate about climate change has become increasingly ideological and partisan. But climate change is not the product of a belief system or ideology. Instead, it is based on scientific fact, and no amount of argument, coercion, or debate among talking heads in the media can alter the physics of climate change. Political philosophy has a legitimate role in policy debates, but not in the underlying climate science. There are no Democratic or Republican carbon dioxide molecules; they are all invisible and they all trap heat. What we know today about human-induced climate change is the result of painstaking research and analysis, some of it going back more than a century. Major international scientific organizations in disciplines ranging from geophysics to geology, atmospheric sciences to biology, and physics to human health – as well as every one of the leading national scientific academies worldwide – have concluded that human activity is changing the climate. This is not a “belief.” Instead, it is an objective evaluation of the scientific evidence. The U.S. National Academy of Sciences (NAS) was created by Abraham Lincoln and chartered by Congress in 1863 for the express purpose of obtaining objective expert advice on a range of complex scientific and technological issues. Its international reputation for integrity is unparalleled. This spring, at the request of Congress, the NAS issued a series of comprehensive reports on climate change that were unambiguous. The NAS stated, “Climate change is occurring, is caused largely by human activities . . . and in many cases is already affecting a broad range of human and natural systems.” This conclusion comes as no surprise to the overwhelming majority of working climate scientists. The determination of policy sits with you, the elected representatives of the people. But we urge you, as our elected representatives, to base your policy decisions on sound science, not sound bites. Congress needs to understand that scientists have concluded, based on a systematic review of all of the evidence, that climate change caused by human activities raises serious risks to our national and economic security and our health both here and around the world. It’s time for Congress to move on to the policy debate. The letter from the scientists that do not believe in man-made global warming follows. On 28 January 2011, eighteen scientists sent a letter to members of the U.S. House of Representatives and the U.S. Senate urging them to “take a fresh look at climate change.” Their intent, apparently, was to disparage the views of scientists who disagree with their contention that continued business-as-usual increases in carbon dioxide (CO2) emissions produced from the burning of coal, gas, and oil will lead to a host of cataclysmic climate-related problems. We, the undersigned, totally disagree with them and would like to take this opportunity to briefly state our side of the story. For example, a lengthy review of their claims and others that climate alarmists frequently make can be found on the Web site of the Center for the Study of Carbon Dioxide and Global Change (see http://www.co2science.org/education/reports/prudentpath/prudentpath.php). That report offers a point-by-point rebuttal of all of the claims of the “group of eighteen,” citing in every case peer-reviewed scientific research on the actual effects of climate change during the past several decades. If the “group of eighteen” pleads ignorance of this information due to its very recent posting, then we call their attention to an even larger and more comprehensive report published in 2009, Climate Change Reconsidered: The 2009 Report of the Nongovernmental International Panel on Climate Change (NIPCC). That document has been posted for more than a year in its entirety at www.nipccreport.org. These are just two recent compilations of scientific research among many we could cite. Do the 678 scientific studies referenced in the CO2 Science document, or the thousands of studies cited in the NIPCC report, provide real-world evidence (as opposed to theoretical climate model predictions) for global warming-induced increases in the worldwide number and severity of floods? No. In the global number and severity of droughts? No. In the number and severity of hurricanes and other storms? No. Do they provide any real-world evidence of Earth’s seas inundating coastal lowlands around the globe? No. Increased human mortality? No. Plant and animal extinctions? No. Declining vegetative productivity? No. More frequent and deadly coral bleaching? No. Marine life dissolving away in acidified oceans? No. But don’t take our word for it. Read the two reports yourselves. And then make up your own minds about the matter. Don’t be intimidated by false claims of “scientific consensus” or “overwhelming proof.” These are not scientific arguments and they are simply not true. Andrew Spurlock, Starfire Engineering and Technologies, Inc.
Soames Summerhays, Summerhays Films, Inc. I have occasionally published articles that show not only how flawed the globalist alarmists are, but also point out alternative ideas. For those who want to learn more about the global warming scam, and some of the science that argues against CO2 being the primary driver of global temperature, I suggest that you read “Climate Change Reconsidered: The Report of the Nongovernmental International Panel on Climate Change (NIPCC)” It is a massive, and very well referenced report. 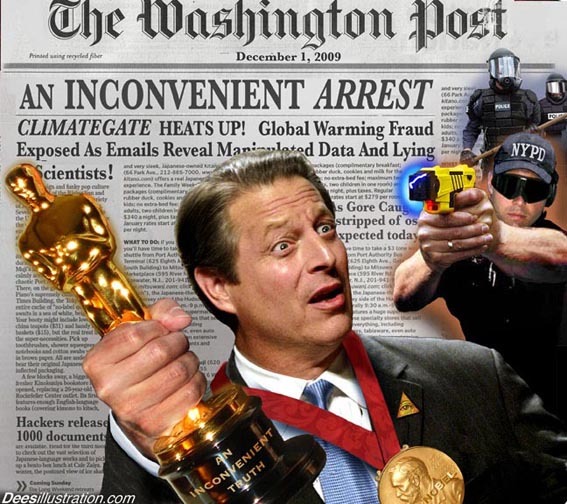 Posted in: Al Gore, cap and tax, cause of climate change, climate center hack, climate change, Climate scam, climategate, Congress, cop-15, Copenhagen, cosmic rays, cosmic rays and climate, cosmic rays and clouds, global warming, Global Warming BS, global warming scam, global warming swindle, global warmingistas, human stupidity, science, supressing science, tree ring data.